Hello friends, E-commerce websites like Flipkart, Amazon, Myntra get a discount offer filled on every New Year. But now it will not happen, the Online Shopping Site has been restrained from Central Government that it can no longer offer any discount offer. There are 30 to 70 e-commerce online companies in the country, in which 6 or 7 are the most popular and better positioned, there are some top shopping websites. These are the most shopping sites on which Central Government will have the effect of this new law - out of which 80% of the customers on Amazon and Flipkart use these two websites and they have the highest FDI (foreign direct investment). 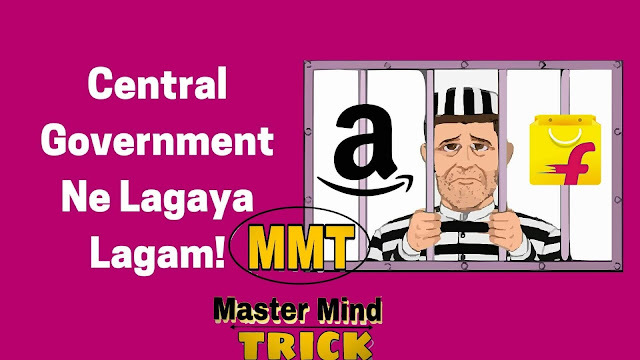 Why did the central government do this and what its Pros & Cons should come in detail? The Central Government of India has enacted such a law to keep the balance in the online and offline shopping business, the e-commerce business in India has completely taken possession of the cities and it is spread rapidly in Town, Village. Used to be. Companies like Amazon, Flipkart, who have more quantity of investment, all of these internets, have reached home through TV Air Hoarding advertising. Customers are attracted by huge discounts on all shopping sites, products, and this also benefits Customers too at their own home and get products in less money. But due to this, the market balance is deteriorating and given this, the government has enacted a new law and under this law, all online e-commerce companies will be reinforced, and in Future, we may never offer any such offer to Flipkart Big Billion Day and Amazon Mega Sale. Can not see Companies like Amazon & Flipkart have their own manufacturing businesses, most of the products like Fashion, Electronics, Kids are themselves made and sell 50% to 80% with a discount, in all the products available on websites They have their own products from 30% to 40%. The government did not have any policy for all of them, so all of them were taking advantage of this and there was a loss in offline trade. The government has quickly prepared a new policy road map, under which, any online e-commerce website cannot produce more than 25% of any particular brand or seller from now on. If you understand this in a simple language, OnePlus, which is a popular smartphone brand, whenever it has a new model launch it is exclusively 99% (May Be) sale on Amazon. The stock of this phone is not owned by any other website nor does it have any official website, this new rule of government, now if any OnePlus latest phone launch, then Amazon can only sell 25% of the stock on its website, but 75% of Stock OnePlus needs to be sold in any other way. It is not difficult to tell who will benefit from the new government, who will benefit from this new move, because there is no doubt that the bigger E-commerce stores than the Government New Policy will make a difference to their business. The Walmart - Flipkart deal has happened just recently and everyone knows about it that Walmart will now sell all its product Flipkart and will not allow any local small business to come forward. But now Walmart cannot do this now, because only 25% can sell their products on Flipkart; For the rest of the products, they have to resort to local and small companies, a seller. After the implementation of this law, there can be considerable similarities in price in the online and offline market, this will reduce the sales of online sites and increase the sales of the offline market, which is good for small shopkeepers, business. Guys, government new E-commerce business law will now have some relief from the offline business owners in the market as they will get equal opportunities for the business as well as to join the online portal because even on online e-commerce portal such as brand We used to see that which is big and popular. But now small traders can also get a chance. How did you feel about this law? if you have any questions then you may ask and comment, thanks very much!